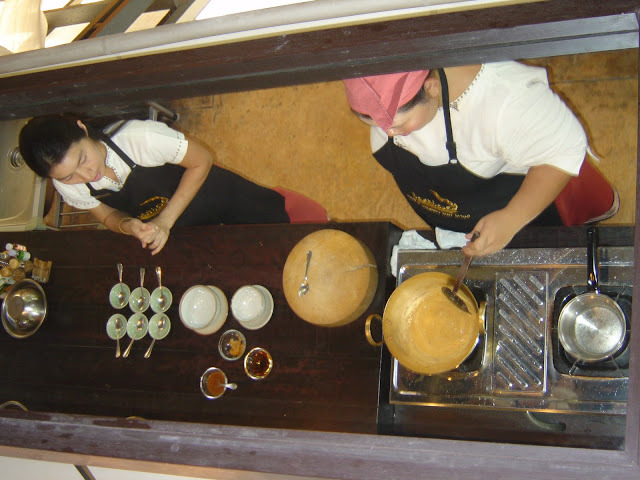 I had a 4 day stop-over in Bangkok and I wanted to spend a couple of days in a Thai cooking school. After looking around on the web I decided on the Bai Pai, mainly because I liked the sound of what they where offering on my desired dates. They are also reasonably priced - another important factor. The school offers a Hotel pick up. I stayed at the Sofitel Silom and the ride to the school in the Bangkok traffic was unbelievable - we travelled at a snail's pace. The driver was also over 45 minutes late for my pick up, due to traffic! We arrived at the school, where I met the rest of the group and our instructor. After a few minutes we all piled back into the van and went to a local market to buy our bits and pieces. The class was loads of fun, excellent company and great intructors.